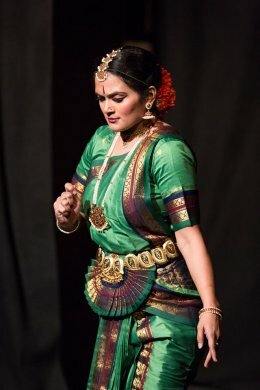 Rasadhwani celebrated World Dance Day 2018 on 27th April with a performance amalgamating Bharatanatyam presentation by Shivangee Vikram, mukhaja abhinaya by Dr. Uma Anantani, poetry rendition by Dr. Ranjana Harish and poetry appreciation by Neha Krishna Kumar. The event 'Romancing the Lord' was presented at Oroborous Theatre at Ahmedabad. The multi lingual presentation encapsulated the age old tradition of madhura bhava bhakti which is still in vogue today. 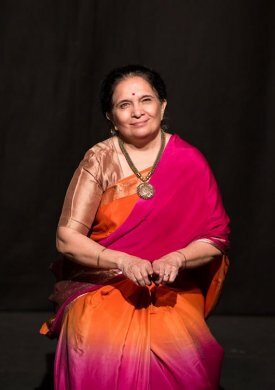 The multi dimensional presentation highlighted vishishta - advaita philosophy reflected in Bharatanatyam margam where a seeker transforms herself from mundane to sacred and from there to sublime. The experiment was well received by rasikas. A booklet comprising the hand painted sketches of various dance forms by Koral Adenwala with quotes on dance by legendary global dancers was presented to the dance gurus as part of tradition of seeking blessings befitting the occasion.